Darkestorme is the name of Alternative Armies' high fantasy skirmish game (although it is also supported by their sister company 15mm.co.uk). 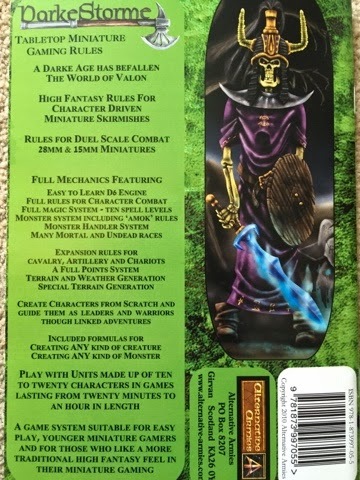 The back of the A5 book promises a pretty comprehensive ruleset for 60 pages and says it is for those who like a more traditional high fantasy feel in their miniature gaming. So does it deliver? The book starts off with a contents page and a decent map of Valon. This is the nominal setting of the game, but not one enforced by the rules as such. Players are free to use whatever figures they want and in fact the figure ranges by AA and 15mm.co.uk are pretty generic high fantasy (and certainly worth a look if you are in to old-school type games). Let's take a look at the various sections in the book before moving on to how the game plays. The title sums up the contents of the first section! As with other AA products, this is a detailed background and interesting to read. For anyone who plays Slaughterloo or Flintloque, it is worth a read to find out about Valon before the advent of black powder weapons. In fact much of it is more 'serious' in tone than those other games, with much less of the tongue in cheek place names and such. Worth a read even for those who normally skip the fluff! This section presents the bulk of the rules. Here is information on the basics of combat, terrain, weather, monsters and so forth. Terrain generation consists of rolls on two tables, one for the general terrain type and then one for terrain features. A roll for a more wild general terrain will give more rolls on the second table. The third table is the most interesting, however. Not technically terrain set up, it involves rolling for each unit to determine when they make contact with the enemy. This can range from being caught in a trap to spotting the enemy from a distance. In practice this means your opponent may be able to set up your unit, or you might be able to choose an initial placement, but your enemy can move your figures a certain number of inches. This is an interesting method and could yield some chaotic set ups! After set up, a roll for weather is made, with the usual range of effects (plus the chance of a magic storm making wizards more powerful!). Finally a check can be made for special terrain. This brings to mind early (and I think one of the more recent) versions of Warhammer where not all terrain is your standard forest or scrub. Some of the 'terrain' is truly special and can include magic creature which attack players, or a giant poisonous mushroom! It certainly is good inspiration if players want to expand on this and make up their own special terrain as well. The rest of this section covers the turn structure and combat, which I shall return to in a bit. After the main bulk of the rules, there is an additional section covering cavalry, artillery and chariots, should players wish to include these in their games. A generous list of spells is also located here, divided across 10 levels of power, most of which contain around 7 or 8 spells. This gives lots of variation for people who like their wizards! This covers the creation of warbands and heroes (or villains!) and includes lists of weapons, armour, magic items and skills. Possibly the weakest section in the book. This is a simple introduction to creating your own scenarios and a list of how experience points and money is gained. The implication seems to be that an Umpire would be governing how a campaign is run, so there is no real detail on this, which is a shame. The final section in the book gives a decent list of stats for the different races in Valon, but also a comprehensive points system allowing you to create game information for any figures in your collection. There are also special rules for larger monsters, such as Trolls, Giants and Dragons. Characters in the game have scores they need to achieve on 2d6 in order to cause a wound, resist a wound caused to them and resist magic powers. In addition to this they have a move and run rate in inches. So a basic human might walk 6 inches, run 9 inches, cause a wound on 9+, resist a wound on 8+ and resist magic on a 5+. Characters are grouped into Units and lead by a Leader and a Sub-Leader. If the leader falls, the Sub-Leader can take command. It is usually worth having both as a Unit with no leaders will flee the battle! Initiative is an opposed 2d6 roll, with the winner deciding the order in which Units will activate. When a Unit activates, its members can act in turn taking up to two actions to move, attack etc. If you are within the 'Reach' score of your weapon you can make an attack. Ranged attacks also roll against the 'Cause Wound' score but have an additional range modifier (-1 per 6" distance) and usually require an action to reload. Mages usually cast magic successfully (with a small chance of failure or a backfire), but the target gets a chance to resist. Armour gives the wearer a save roll and may break in the process, and the same is true of shields. There are also a handful of special rules and abilities which can be used to spice up your heroes and leaders. All in all it is a pretty simple game, or perhaps I should call it straightforward as too many people seem to take 'simple' as being a negative thing. It is similar to games like G.A.S.L.I.G.H.T. in that the mechanics are straightforward and give a relatively quick, fun game. I'll have to say straight up that I quite enjoy these rules! They fill a certain gap for me in that they have a real 'old-school' feel to them and I can plonk a handful of figures on my table and play a game in an hour or so without having to think too hard about the rules. This is ideal for the times when I don't want to fight a large battle or play a game that is highly detailed or complex. In the interest of fairness, I have to say that they are not without flaws (which rules aren't?!). Most oddly, the points calculation seems to result in characters costing more if they are less able to resist magic! There a few ways to correct this, but I opt for changing Resist Magic rolls so they need to score equal or lower, rather than equal or higher. I also prefer to ignore the chance of armour breaking. Take, for example, 'Acceptable' armour with a rating of 2. This means you can prevent a wound on a roll of 1 or 2. But all armour breaks if you roll equal to the armour rating. So while it has a 1 in 3 chance of stopping a wound, it also has a 50% chance of breaking when it does so! I'd have a right go at the blacksmith for calling that 'acceptable'! If I was using the rules for armour breaking, I'd probably just have it break on a 6, or require a separate roll to see if it broke. But neither of the above are major things that stop me enjoying the rules. For a mere £8 I consider them to be well worth the money and they are now my fantasy skirmish rules of choice. You can buy them from Alternative Armies here and AA also provide free PDF documents in support of the system if you drop them an email. 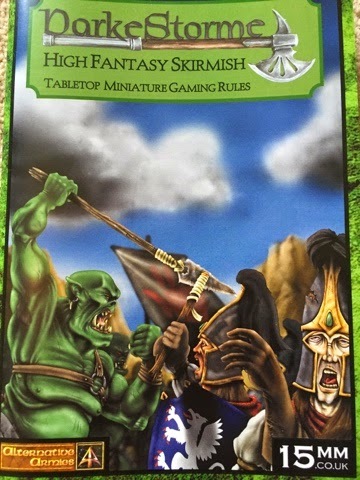 Check out these rules if you want an old-school style fantasy skirmish game that is easy to expand with your own special rules and adapt to your own collection of figures. I'm always interested in seeing different takes on wargaming rules. No matter how "simplistic" a rule system is, I believe there's always something you can glean from them......even if it's how "not" to do it. It's a hard thing to do I reckon, creating a good gaming system. Too much detail & the game gets bogged down to the point of unplayability. Too little & there's not enough to immerse yourself in to find the game enjoyable. And to top it all off, everyone has a different concept of "enough" detail. I really enjoeyed your review and battle report. I dont know why but so little is known about this system. I wonder why. How does this compare to say: playind Warhammer 3. edition without regiment restrictions? I'm really looking in a nice scirmishsystem for my small fantasy collection? Thanks very much for your comment. I enjoy Warhammer 3rd and 4th edition, but have never particularly liked them for skirmish type games. Darkestorme is much simpler than Warhammer 3rd edition though. Figures basically only have two stats to worry about. So it depends what kind of game you see after I suppose.